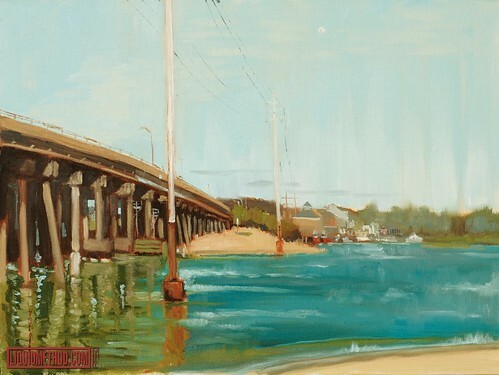 "Lesner Bridge" Plein Air 16x12" Oil on Board, originally uploaded by Liquidmethod. Was really happy yesterday about my speed progress. I almost completed this in 2 hours. The 95% of this was done. I finished the power lines, moon and bridge holes afterwards. My goal is to get my speed up consistently so that when I compete in plein air paint outs, I'm not totally freaking out.